BEIRUT: Russian air strikes killed two people in Syria’s Idlib Friday, a monitor said, as President Vladimir Putin was in Tehran for a summit on the fate of the last major militant bastion. Putin, who backs the Damascus regime, was to meet the leaders of fellow government ally Iran and militant ally Turkey to determine the future of the northwestern province on the Turkish border. Government forces have been massing around Idlib for weeks ahead of an expected offensive on the province, which is held by militants led by Al Qaeda’s former Syrian affiliate and rival Turkish-backed militants. 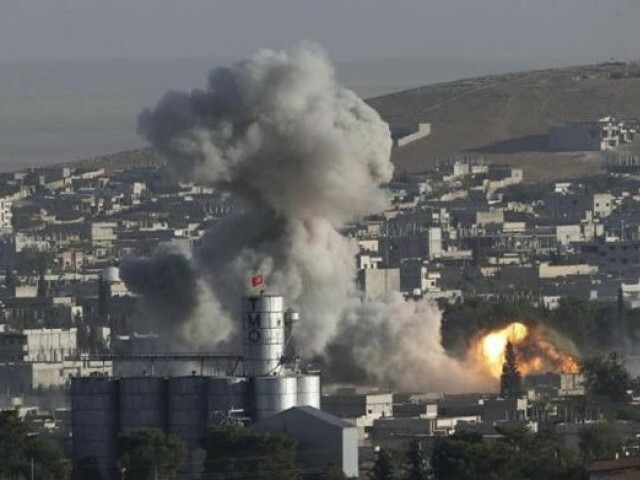 On Friday morning, Russian air raids targeted militant positions in the southwest of the province, the Syrian Observatory for Human Rights said. Among them were positions of the Hayat Tahrir al Sham (HTS) alliance, as well as of the hard-line Ahrar al Sham group, the Britain-based monitor said. They destroyed one Ahrar al Sham post, killing one of its fighters and wounding 14 others in the area of Hobait, it said. “The aim was to destroy militant fortifications,” Observatory head Rami Abdel Rahman. HTS controls more than half of Idlib province, while other militants, including Ahrar al Sham, hold most of the rest. On Thursday, Russia said it would continue to kill ‘terrorists’ in Idlib and elsewhere in Syria to bring back peace. Aid groups have warned that any military offensive in Idlib could spark one of the worst humanitarian disasters of Syria’s seven-year civil war. Almost three million people live in Idlib and adjacent militant-held areas, half of whom have already been displaced from other parts of the country, the United Nations says. More than 350,000 people have been killed and millions displaced since the war erupted in 2011 with the brutal repression of anti-government protests.